1. The Panel’s visit to these two beautiful and important historic towns in Hertfordshire was triggered by analogous development proposals. In each case, retail development was proposed and was justified on dual grounds – first, revitalising existing retail by attracting currently absent national players – second, thereby regenerating the economy and other parts o f the town. In both cases this proposition deserves testing, not least because of particular characteristics of Hertfordshire. It was immediately apparent to Panel members that the contiguity of the main towns of Hertfordshire, not only to each other but to other towns across the county border, such as Braintree and Harlow, was a critical consideration. The ten District Councils, each of which naturally promotes its own case, now have no Regional Spatial Strategy within which to mediate those cases, nor does the County Council, which had not supported the RSS, appear to be able to promote a hierarchy. Yet all the towns continue to be subject to development pressures and opportunities many of which turn out to be externally generated, standard retail development schemes. Panel members were clear that simply upgrading the retail offer across all the major towns would have significant physical impact but could not resolve the perceived problems of loss of economic activity to neighbours because every town would be improving in the same way at the same time. Acknowledging the current political volatility afflicting regional planning, the Panel members nonetheless urged the County Council to support its constituent districts and the Local Economic Partnership in moving towards policies which would allow each place to make its own distinctive contribution to the continuing character of Hertfordshire as a beautiful and dynamic alliance of neighbours. 2. Accordingly, Panel members urged the two communities to which its attention was turned on this occasion to concentrate, above all, on the particularity of the two towns; to seek development which reinforced the character of the place; to press development partners for the highest standards, not only of design, but of forward-looking sustainable propositions for the whole town and to stand firm in resisting formulaic proposals which could just as readily have emerged in any neighbouring town. In doing so this would echo the government’s recent definitions of sustainable development. In both cases Panel members urged authorities, communities and developers to take the fullest possible account of the rapidly changing nature of the retail market. While the retail figures cited in justification of the proposed developments were relatively recent, the impact of internet commerce is increasing and rendering bringing existing business models into question. This is no time to predicate the future of towns on an untested belief in previous patterns of behaviour. 6. The Panel’s county wide comments self-evidently apply to Hitchin as well as to BS. Certain other comments above, particularly those about formulaic, locally indistinct, standard development models also apply. However, specific Hitchin matters are quite different. 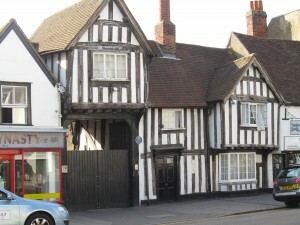 First, although the same descriptive terms might be applied to both Bishop’s Stortford and Hitchin – important mediaeval and later towns whose strong character and quality derives form the survival of fabric from most centuries disposed in a compatible and harmonious form – the places naturally differ. Hitchin’s pre-Norman importance is no longer physically visible, but it is undoubted and its archaeological expression must be expected. Both monastic sites exist only as fragments, but each exerts a strong influence on the town and while the Priory is relatively stable, the setting of St. Mary’s is a core matter of relevance to current development proposals. While both towns have infilled market places, the clarity of Hitchin’s elongated space with burgage plots intact, many containing early timber framed fabric, is special. The consistent two and three storey scale and relatively narrow streets of the mediaeval core create a strong and attractive character which, unsurprisingly, is animated by thriving local businesses and busy residents. Panel members approached the market place along Bucklersbury and few could recall a place with so much commercial activity without any national chains present. The relative density of these spaces make eventual arrival at the market place followed by the discovery of the churchyard, the river and St. Mary’s Square beyond, all the more striking. The obvious conclusion is that it is on these strengths that Hitchin must build, if none of these highest quality characteristics are to be lost. Nor, any more than BS, does Hitchin need to rush for development. Its historic development has encompassed very significant change while retaining distinct character and vitality. Such must be the ambition for this next phase. Hermitage Road and the vision for St. Mary’s Square, had it been completed, would have constituted a very strong move into the C20, in obvious counterpoint to developments at Letchworth. But they would not have overwhelmed the town and the strikingly modern and different architecture of that phase was confident enough to generate a language which entered a civilised discourse with the existing town. 7. The fact that St. Mary’s Square was not completed did leave a significant development opportunity and the community will from time to time want carefully to consider what should go there. However, just as in BS, there is no crisis, no need for a precipitate rush to action and little evident need to reject recent assessments of the nature and potential of the space. Before commenting on the proposal for the site, Panel members hoped that the following observations would be found helpful: St. Mary’s is a nationally important ecclesiastical site, about which understanding is continually deepening. It still dominates its large churchyard despite some encroachment and the great loss of the church house. Its presence on early maps is striking and sets a good precedent for the future. If change is agreed upon, there should be noted to be the potential to create a new, enhanced setting not unlike that of other minster and cathedral closes. The C20 interventions into that setting differ markedly. The incomplete St.Mary’s Square has provided an important C21 asset – a car park that also provides a sense of arrival, although this has not been matched by the setting provided by development in Queen Street. It sits on a plinth overlooking the canalised river Hiz and the east end of the church. Whatever happens here has to enhance the latter, striking assets. The tail end of the Churchgate retail development and the striking market buildings are of a less harmonious form; together, however, they animate the space. Furthermore the shops in the centre are all occupied, and the panel felt that a remodelling of Churchgate, especially on the Market Square frontage might be a more sustainable option that should be considered. Portmill Lane was historically important to the town and its potential for development is considerable in its own right (particularly if the post office site comes into the picture). It and the other two elements of the site should be considered in their own right and, quite likely, developed at different times in order that the street may be remade. Stevenage and, to a lesser extent, nearby Luton have their own qualities and characteristics, but they are very distinct from Hitchin. Large stores will look to build on the established critical shopping mass in those towns and shoppers will continue to find more choice there and farther afield. It behoves Hitchin, therefore, to look the gift horse of a major store very carefully in the mouth and examine whether the reinforcement of local specialised retail, product based farmers markets and so on are not more in character with Hitchin and more likely to offer a viable and distinctive future. Like BS, Hitchin is unlikely to be blessed with major new infrastructure and the nature of its connections to its immediate hinterland is unlikely to change – so car parking will continue to be needed to some degree. However, the mainline station is near the town centre and Hitchin is a compact and walkable town. Pedestrian connections could be encouraged and improved. Existing cycle use, not only within the town but beyond, should be built up. St.Mary’s Square undoubtedly has the potential for development and increased use. There was little wrong with the Bennett and Bidwell concept of buildings around a square. In the C21 context, that might be a square which was used for additional markets and events, whilst the original Market Square continues to function as a civic space. If (additional) parking was thought essential, it could be provided below the square while the principles of the stepped plinth to the riverside was protected. 8. In the light of all the above, it will surely come as no surprise that Panel members saw little merit in the current proposal emerging at Churchgate. They regretted not being able to meet representatives of NHDC to hear the case for this kind of development being put, but imagined they would have been unlikely to be convinced. The Simons scheme appears to have been generated by a wish to impose on Hitchin a standard and, frankly, alien retail development. The Panel has indicated above the unlikelihood of this succeeding in towns across Hertfordshire and urges that more thought be given to the desiderata set out above (and others voiced more appropriately by the community) before any scheme is finalised. The Panel saw a summary of the Churchgate Development Area Planning Brief; some members thought that the illustrative scheme associated with it was as meek as the current Simons scheme is overbearing. But they did not question the Design Principles it embodied and could find no justification for their being casually overturned. In the light of the emerging new planning system, the Panel thought there was much to be said for this site being the subject of a Neighbourhood Plan. Members believe that this new, albeit untested, approach has obvious potential for delivering community endorsed schemes of the highest quality. There is great understanding of the merits of Hitchin today – that understanding is local and vocal, but it may also be readily backed up by professional input. A Neighbourhood Plan could, by the necessary consultation ensure, that the scheme that emerged was representative of the wide interests of those who live in and use Hitchin. Tested by referendum, it could give NHDC and its development partner great certainty and a benign local political context. Finally there is every reason to hope it might provide the framework within which the C21 contribution to the long story of Hitchin might prove as successful as its past. k) emphasised the potential of a Neighbourhood Plan for central Hitchin as the vehicle for producing a secure and widely endorsed proposal. The English Heritage Report contains not only their opinions on the Simons scheme of 2010, but it makes suggestions as to how a Churchgate development might be approached. It also makes interesting comments about Hitchin’s retail and architectural context. The Panel drew attention to the County context: the main towns in Hertfordshire are close geographically, with many subject to outside development pressures for standard retail schemes. Councils should stand firm in resisting such schemes; sustainable development means promoting the highest quality. Both Hitchin and Bishop’s Stortford should concentrate on the “particularity of the two towns”; development should reinforce the character of a place and achieve the highest standards of design. Few panel members, on seeing Hitchin’s Market Place, could recall a place with so much commercial activity without any national chains present. Hitchin has evolved incrementally and there is no need to rush into development, they said. Due to the changing nature of retailing, this is no time to predict the future of towns on existing retail models. St Mary’s is a nationally important ecclesiastical site and “if change is agreed upon, there should be the potential to create a new, enhanced setting not unlike that of other minster and cathedral closes.” Whatever happens on St Mary’s Square has to enhance the church’s east end. The rear of Churchgate and the “striking” market buildings are not harmonious with regard to St Mary’s, but together, they “animate the space. Furthermore, the shops in the centre are all occupied, and a remodelling of Churchgate, especially on the Market Square frontage, might be a more sustainable option that should be considered.” Churchyard and St Mary’s Square should lead proposals; the latter has potential for development with car parking below. Car parking is important but pedestrian connections could be improved and cycle use should be built up. Portmill Lane and the Post Office site have considerable potential for development, should be considered in their own right and, quite likely, developed at different times. “The Panel members saw little merit in the current proposal emerging at Churchgate . . . The Simons scheme appears to have been generated by a wish to impose on Hitchin a standard and, frankly, alien retail development. “ The Panel did not question the Design Principles of the Churchgate Planning Brief and could find no justification for their being casually overturned, though some members found the illustrative scheme ‘meek’. The best approach might be to prepare a Neighbourhood Plan for the area, supported by consultation and tested by a referendum. This report is important because English Heritage has to be consulted under planning law. We hope everyone involved in the Churchgate redevelopment will take it on board. Simons must now rethink their position and then perhaps we can arrive at a solution that allows them a profit but gives Hitchin a scheme of which we can be proud. The Government wants local people to be involved in fashioning their environment and that means that all “stakeholders” – the Councillors, the Council employees, the developers and local people – must adapt to a new way of working. Are we up for it?